In preparation for designing our parking lot gardens, CMBG horticulturist and landscape designer Jen Dunlap researched forest restoration and studied the process of naturalizing areas. She researched the species growing in Maine’s native forests, then branched out to add diversity to her design plans. The common denominator in all of her research was native plants. As natural spaces dwindle, native insects, birds, amphibians and mammals lose their habitats. Here at the Gardens, we’re committed to using native plants in our landscaping in order to conserve biodiversity, contribute to a living landscape and to create pollination and migration corridors for animals and insects. Native species, already adapted to our particular growing conditions, work immediately toward restoring habitats for all creatures, regardless of where they fall on the food chain. Though most native species are perennials and slow to grow, they are long-lived, low-maintenance, strong and resilient. 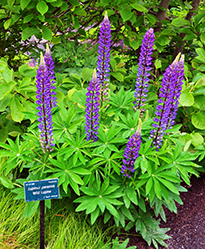 This year’s new native plantings will include sundial lupines (Lupinus perennis), the beardtongue ‘Blackbeard’ (Penstemon), and Virginia bluebells (Mertensia virginica). Those familiar with the Maine landscape are probably familiar with lupine and their fragrant, pea-like, blue-to-violet flowers that bloom in late spring. Besides being an iconic symbol of Maine, lupine enhance soil fertility by fixing nitrogen into a useful form in the soil. This particular lupine, sundial, is the sole host plant for the karner blue butterfly and a host plant for the frosted elfin butterfly. Sundial also attracts other beneficial pollinators and hummingbirds, while birds and small mammals enjoy the seeds. Aaaarrrrgggghhhh! Because of its dark, eggplant-colored foliage, Penstemon ‘Blackbeard’ was named after the infamous English pirate. Bright lilac-purple flowers stand tall, and attractive dark burgundy seed pods follow the flowers. ‘Blackbeard’ is a magnet for hummingbirds and bees and sure to cause delighted cries of “Yo, ho, ho, me hearties!” from all who cross its path. 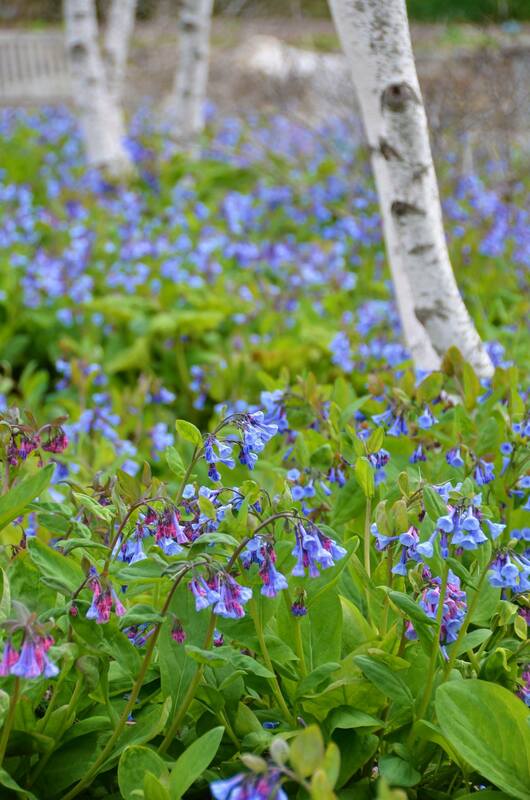 Though they’re called Virginia bluebells, these flowers are native as far north as Maine. When the cheery, trumpet-shaped flowers bloom, you know spring has arrived. These beauties start off pink, then slowly transition to a soft blue as flowers develop. Bluebells are perfect spring ephemerals for woodland gardens, and this herbaceous wildflower happily seeds itself in the garden, quickly forming a community of large drifts.